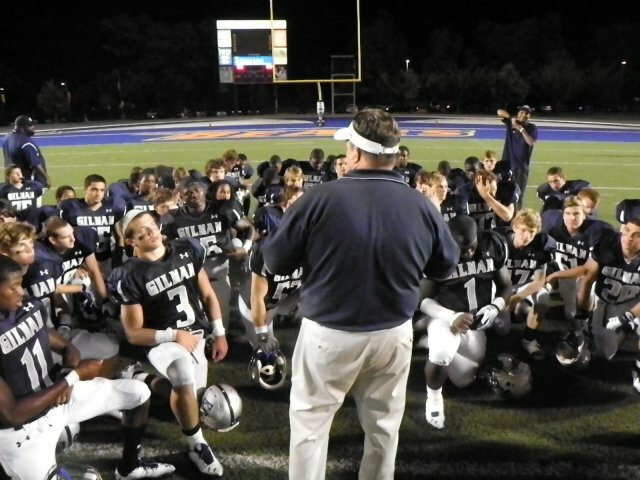 "What happened that first day at Gilman [High School] was entirely unlike anything normally associated with high school football. It started with the signature exchange of the Gilman football program -- this time between [head coach] Biff [Poggi] and the gathered throng of eighty boys, freshmen through seniors, who would spend the next week practicing together before being split into varsity and junior varsity teams.
" 'What is our job?' Biff asked on behalf of himself, Joe, and the eight other assistant coaches.
" 'To love us,' most of the boys yelled back. The older boys had already been through this routine more than enough times to know the proper answer. The younger boys, new to Gilman football, would soon catch on.
" 'And what is your job?' Biff shot back. 'To love each other,' the boys responded. "I would quickly come to realize that this standard exchange -- always initiated by Biff or [defensive coach] Joe [Ehrmann] -- was just as much a part of Gilman football as running or tackling. "How would the boys make the most impact? Almost anything Biff ever talked about could be fashioned into at least a partial answer to that question. "For one thing, they would make an impact by being inclusive rather than exclusive. "The boys would also make an impact by breaking down cliques and stereotypes, by developing empathy and kindness for all. "'Feeling what the other person feels,' said senior Napoleon Sykes, one of the team captains, a small but solid wide receiver and hard-hitting defensive back who had already accepted a scholarship to play college football at Wake Forest. "That was the whole idea behind Biff and Joe's ironclad rule that no Gilman football player should ever let another Gilman boy -- teammate or not -- eat lunch by himself. "How else would the boys make an impact? "By living with integrity ... and not only when it is convenient to do so. Always. "By seeking justice ... because it is often hidden. "By encouraging the oppressed . . . because they are always discouraged. "Ultimately, Biff said, the boys would make the greatest overall impact on the world -- would bring the most love and grace and healing to people -- by constantly basing their thoughts and actions on one simple question: What can I do for you? "Biff and Joe would constantly elaborate on all of this as the season progressed.
" 'Because in case you haven't noticed yet, we're training you to be different,' Biff said. 'If we lose every game of the year, go oh-and-ten on the football field, as long as we try hard, I don't care. You learn these lessons, and we're ten-and-oh in the game of life.' "